NEW YORK,NY – The Rea Award for the Short Story, a $30,000 annual prize, is awarded this year to DEBORAH EISENBERG, author of three acclaimed collections of short stories and a distinct voice in American fiction. The Rea Award for the Short Story was established in 1986 by the late Michael M. Rea to honor a living United States or Canadian writer who has made a significant contribution to the short story form. The award is given not for one specific work, but rather for the writer’s originality and influence on the genre. Michael Rea, who a passionate reader and collector of short stories aw well as a writer, established the award to encourage writers to maintain loyalty to the art of short fiction and to ennoble the form. The award continues under the direction of Mr. Rea’s wife, Elizabeth Richebourg Rea, a photographer and curator. The Rea Award for the Short Story is the only award in the United States exclusively for the short story and is sponsored by the Dungannon Foundation, which Mr. Rea established to administer the award. The recipient is nominated and selected by a jury of distinguished writers. At once expansive and compressed, generously compassionate and surgically precise, elegant and searing, Deborah Eisenberg’s luminous fictions peels back the carapace of the visible world to reveal secret layers and levels, the wonders of the parallel universe that underlies ordinary reality. Embracing poetry and philosophy, the grittiest political realities and the most exalted mysteries of the human heart, the griefs of childhood and the consolations of retrospect, her collections – from the earliest, Transactions in a Foreign Currency, to the most recent, ,All Around Atlantis – remind us (in case we need reminding) that the short story can be as capacious, as dense, as profound and rewarding as the longest and most ambitious novel. Deborah Eisenberg is the author of three short story collections, Transactions in a Foreign Currency (1986, Knopf), Under the 82nd Airborne (1992, Farrar, Straus & Giroux), and All Around Atlantis (1997, Farrar, Straus & Giroux). Her work, The Stories (So Far) of Deborah Eisenberg, published by Noonday Press in 1997, combines the author’s two earliest collections in one volume. 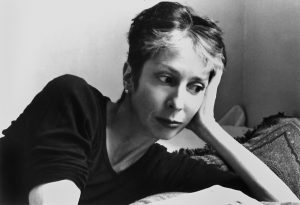 Deborah Eisenberg is also the author of a play, Pastorale, which was produced by Second Stage in New York in 1982, and has written for The New Yorker, Bomb, and The Yale Review. She is the recipient of a Whiting Writers’ Award, a Guggenheim Fellowship, and three O. Henry Awards. She is a professor of Creative Writing at the University of Virginia. She is currently playing the role of Judy in Wallace Shawn’s play, The Designated Mourner, directed by André Gregory. Deborah Eisenberg is consistently acclaimed for her strong portrayal of characters dealing with the confusion of modern life. She has written – always subtly and profoundly – about a range of subjects, including our involvement in the governmental affairs for Central America, the influence that the Holocaust continues to exert on our consciousness, and the ways in which we, as adults, consistently ignore and misunderstand the fragility and complexity of our children.